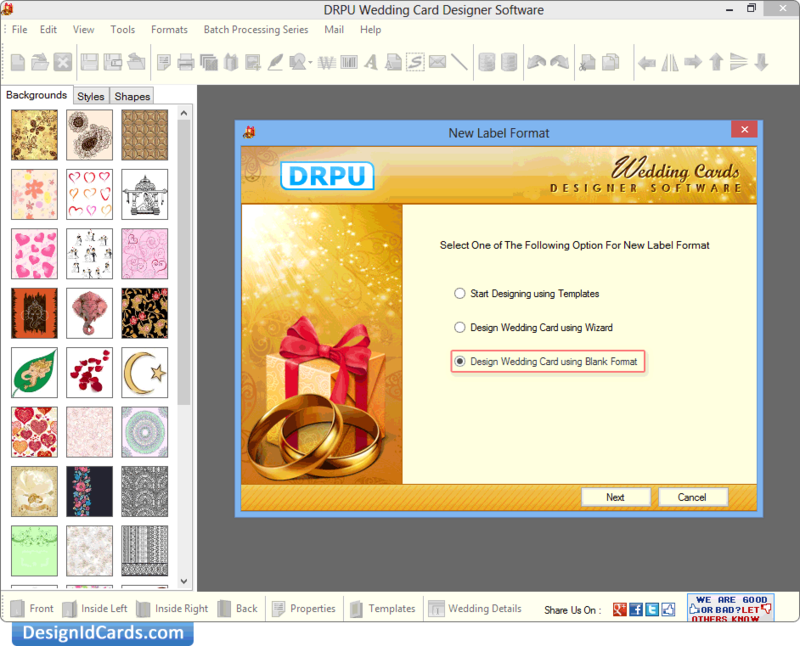 DRPU Wedding Card Designer Application gives you an option of designing printable wedding cards. With the help of its different card designing options you can add signature, barcode and ClipArt in your card. You can also browse and insert image on your invitation card. * Design bulk number of invitation card using batch processing series option. * Make your text more attractive using inbuilt WordArt. * Create invitation cards using different predefined templates. * Enables you to add Signature and barcode labels. * You can design cards in different fold type like Quarter Fold, Half Fold and postcard (no fold). * Give a better look to your card using different background images or modifying its colour properties. * Design your card in different shape and sizes including rectangle, ellipse, rounded rectangle or in CD/DVD shapes. * You can insert images from library during designing your wedding card. * Option to export designed cards in various file format such as PNG, JPG,ICO, TIFF,GIF,BMP,PDF and many others file format. * Provides an inbuilt email sending wizard facility to deliver the designed invitation card on your desired email address. * Easy to make invitation card without having any technical training or expert guidance.